The Government should limit or temporarily stop issuing new Government bonds during the remaining months of the year while waiting for the improvement of public investment disbursement. 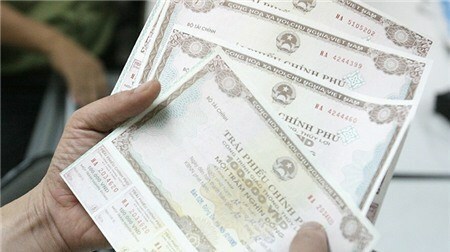 Hanoi (VNA) - The Government should limit or temporarily stop issuing new Government bonds during the remaining months of the year while waiting for the improvement of public investment disbursement. According to analysts at Bao Viet Securities Company (BVSC), the halt will help the State budget partly reduce the cost of paying interest for loans that are temporarily not needed. The recommendation was made after reports showed the State Treasury deposits some 160 trillion VND (7 billion USD) at commercial banks in the first eight months, up 68 percent against early this year, due to sluggish public investment disbursement. Statistics showed that capital mobilised from the issue of G-bonds in the first eight months of this year was very positive, however, it was quite a contrast to the disbursement of the capital source. According to the Ministry of Finance, total capital mobilised from G-bonds in the first eight months of this year reached nearly 144.1 trillion VND (6.34 billion USD), equal to 78.6 percent of the annual plan. However, unlike the success of G-bond mobilisation, disbursement of the capital source during the period was very slow. Just 2.46 trillion VND was disbursed, equal to only 4.9 percent of the plan. In a bid to speed up disbursement, Minister of Planning and Investment Nguyen Chi Dung recently sent a dispatch to ministries and central and localities to urgently report on the implementation of Resolution No 70 / NQ-CP, dated August 3, on solutions to accelerate the implementation and disbursement of public investment plans. Dung also proposed specific solutions to effectively implement the public investment plan, including a resolute cut in capital for projects that are unlikely to disburse any funds in 2017 and allocate the capital for other important and urgent projects. The Government will not include projects that use State domestic capital budget in next year’s capital allocation plan if the projects’ disbursement meets less than 30 percent of this year’s plan. Previously, due to the slow disbursement of public investment, including G-bond capital, Prime Minister Nguyen Xuan Phuc also had to ask authorities to take more drastic measures to rectify the late disbursement of investment capital for public projects, noting that the slow disbursement of public investment leads to a bottleneck in national economic growth and rising public debt.